CH908 Sterling silver bodhi leaf charm with aum. The little om pendant is part of our charmas line. It is a 1.5 cm charm with a lobster clasp to make it easy add to your charm bracelet or necklace. The bodhi leaf is an important buddhist symbol reminding us of Buddha's enlightenment as he was sitting under a bodhi tree when he became enlightened. Sterling silver. Made in Thailand. Tiny bodhi leaf charm, also known as pipal leaf. The bodhi leaf is an important buddhist symbol reminding us of Buddha's enlightenment as he was sitting under a bodhi tree when he became enlightened. You can combine it with any of our other charmas or wear it on its own. 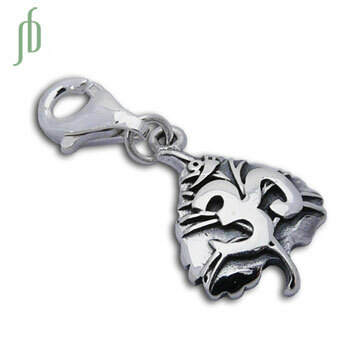 Sterling silver bodhi leaf charm with Ganesh. The little ganesh pendant is part of our charmas line. It is a 1.5 cm charm with a lobster clasp to make it easy add to your charm bracelet or necklace. Bodhi tree pendant hangs from a rubber necklace. The clasp says "shanti" meaning peace . It is crafted out of recycled brass. This is an ideal necklace for men or women. Sturdy, beautiful, eco and fair trade!